Citation: C N Trueman "Polish Pilots in the Battle of Britain"
historylearningsite.co.uk. The History Learning Site, 20 May 2015. 9 Apr 2019. After the swift and successful invasion of Polandon September 1st 1939, many young Polish Air Force fighters made their way to Britain. The Luftwaffe had full control of the skies over Poland. Any attempt to fight the Nazis in the air over Poland would have been futile. However, rapidly modernising French and British air forces were an attractive alternate from doing nothing, especially as the RAF had been equipped with the ultra-modern Spitfire and Hurricane. Many made their way from Poland via Romania to France where they fought in the Battle of France and then to Britain. In total 139 Poles fought in the Battle of Britainand they gained a reputation for aggressive aerial combat. At the start of the Battle of Britain, Polish airmen were distributed among already established fighter squadrons in Fighter Command. However, on July 13th, 1940, they were given their own – 302 (City of Poznań) Squadron. It was equipped with Hurricanes and became operational towards the end of the battle. 302 Squadron was overshadowed by the highly successful 303 Squadron. 303 (Kosciuśzko) Squadron was based in Northolt. 303 was formed on August 2nd and was first blooded on August 30th when during a training flight it came upon German aircraft that had penetrated into 11 Group’s forward defences. The squadron leader, Ronald Kellett, failed to respond to a Hurricane pilot, Flying Officer Ludik Paszkiewicz, who asked permission to attack a Dornier. Despite this lack of permission, Paszkiewicz attacked and brought down the Dornier. The intelligence report made for this attack referred to ‘Green 1’ (Paszkiewicz) as closing to 100 yards before eventually closing to “point blank range” and destroying the aircraft. 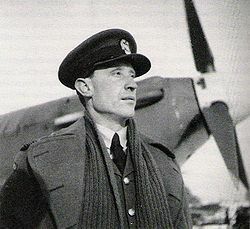 Paszkiewicz was given a public dressing down in front of other Polish pilots by Squadron Leader Kellett for leaving the formation without permission. After this Kellett privately congratulated him and announced that the squadron was now fully operational. Despite arriving ‘late’ to the Battle of Britain, 303 Squadron became a highly successful unit. It destroyed more Luftwaffe aircraft than any other Hurricane equipped squadron and by the time the battle had finished, 303 had the fourth highest tally of all squadrons. One Polish pilot – Witold Urbanowicz – was one of just a few Battle of Britain pilots credited as a ‘Triple Ace’– with 15 ‘kills’ to his name.